I just visited a client today in the Palisades and we're changing a current bedroom into a grade school playroom. Here are a few inspirational photos that helped me get the juices flowing. All very different on different budget levels, yet still all inspiring. 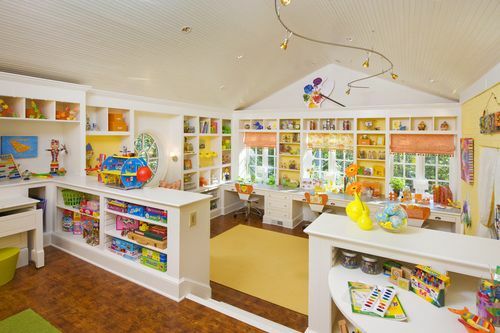 A quaint playroom in the attic of Barbara Garfield's home featured in Coastal Living. I like how the books become artwork when displayed on top of the short windows. The simplicity of the painted tree trunks and the custom slide with hiding space below is modern genius. 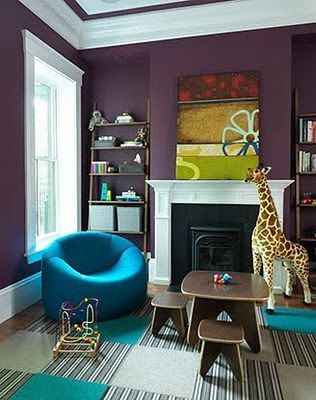 For those of you who have a playroom off the kitchen or family room, this is a nice design using sophisticated colors which do not scream toddler. I'm a big fan of the eggplant and large white molding. Honestly this one is one of my favorites, with the mini game table and custom toy boxes. 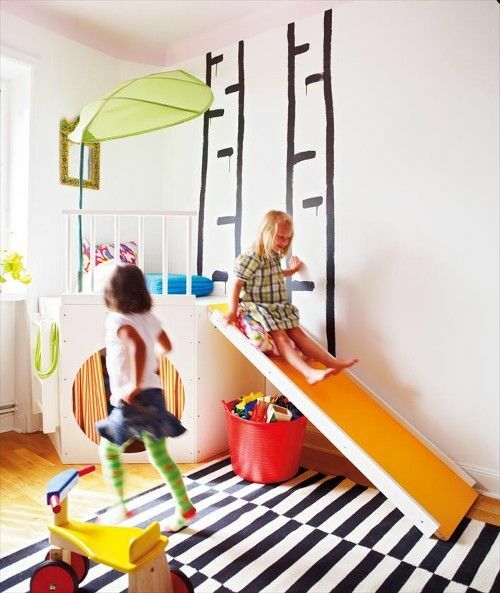 A wonderful way to hide all those toys; behind Ikea cabinets. The orange cubitec shelving below adds a fun pop of color and is easy on the budget, but buyers beware, we are having the hardest time finding storage baskets that are 15" to fit into them to hide toys. 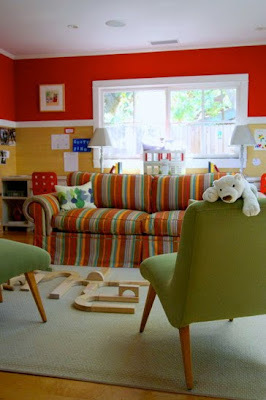 A traditional playroom with plenty of seating for mom and dad & friends. 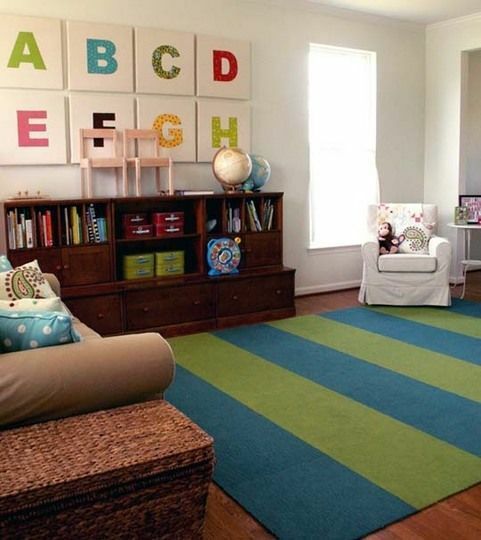 The stripe couch is a nice touch as it hides stains and is a playful punch of color. 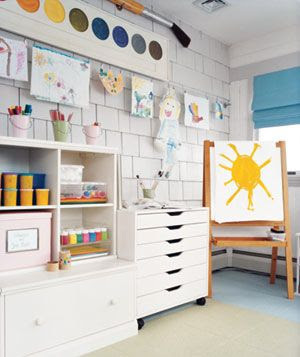 I also like the cork or grasscloth wall where the personal desk are to allow for plenty of space to display artwork and to-do's. design by M. Design Interiors Inc.
Our kiddies playroom is my favorite room in the house! I love that our children have a spot that is tailored for their needs, their desires and their playdates. The room is simple, functional and very organized. I'm going to do a post in the new year (when my custom pillows/other items are done.) Great images! I love them all and all for different reasons. Are you looking for exactly 15" storage bins for the cubitec shelving? Or just something that will fit within the 15" space? 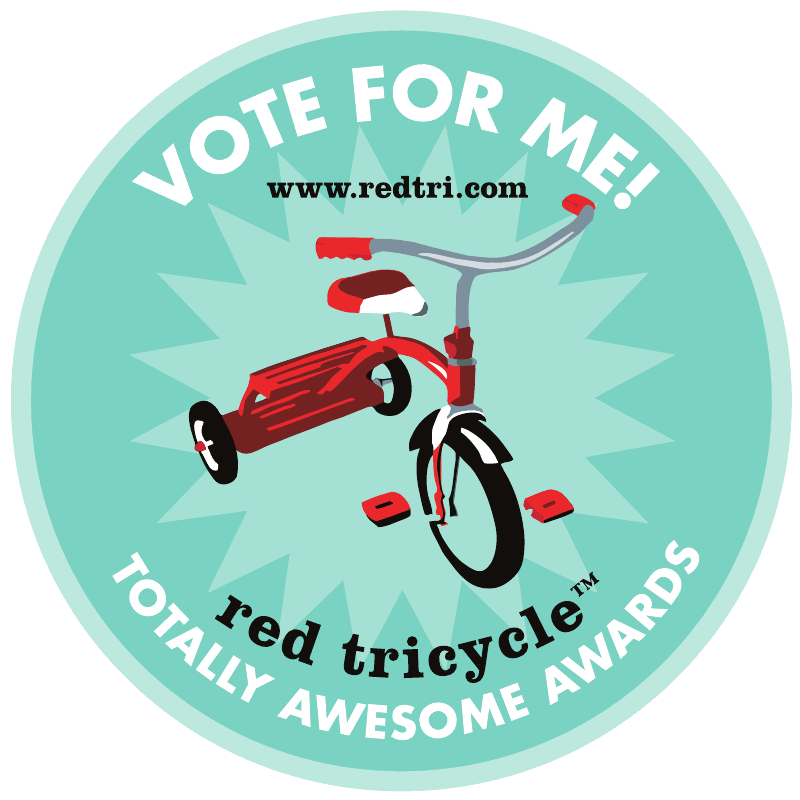 These are a favorite stand-by of mine - http://www.landofnod.com/family.aspx?c=106&f=670 - and they are 11". Space would be left in between the top of the container and the shelf above, but I don't think these colors can be beaten!! Pretty much looking for exactly 15" or 14" at the minimum. But I do love these from Land of Nod! Great colors! Greetings from Melbourne, Australia. Mum and Dad have (smile!) hijcaked the girls so I am having so much fun with my new found free time exploring your blog. Is that cubitec bins a shout out to me!!!?? Love it!! Found these at a local kids store here....pretty good size (almost 13"). A little more organic look, woven paper rope, very soft pink and what they call soft blue...but almost grey and I think would be OK. What do you think?